Popular from Victorian times as a holiday resort, the Isle of Wight is known for its natural beauty and is home to a town that hosts a world famous annual regatta. Queen Victoria was a regular visitor as she possessed a much loved summer residence and final home Osborne House. The world's first hovercraft was built on the island and now an easy way to get to the island is on a hovercraft. 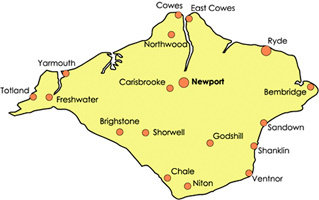 It is home to the Isle of Wight Festival, which, in 1970, was one of the largest rock music events ever held, the Isle of Wight Festival was revived in 2002, headliners in 2006 were Coldplay, Foo Fighters and The Prodigy. The Isle of wight has a stress free and calm sense about it with lots of relaxing activities to indulge in. A fun family holiday destination the Island is popular all year round. And not to forget those who like a physical challenge, With over half the Island designated as an Area of Outstanding Natural Beauty and many footpaths that stretch for miles across the island it's easy to see why the island is first choice with many people.